Pat Hitchcock – Unity Shoppe Inc.
Pat was born and raised in Long Beach, CA. During her college years at Valparaiso University in Indiana, with a goal to become a social worker, she had many part time jobs, including tutoring reading to adults with learning disabilities. Pat spent a few years after her college graduation living and traveling in Europe where she saw the importance of learning something from everyone she met and the incredible kindness of strangers. Returning to the United States, Pat did marketing consulting for 25 years, during which time she met her talented husband and had 2 daughters, always volunteering in their classrooms, organizing an annual high school career fair, and obtaining certification as a substitute teacher. When she decided she wanted to immerse herself in the nonprofit world, she interviewed at several national philanthropic organizations, then discovered the Unity Shoppe, where she found an atmosphere of caring that made all the difference in people’s lives. 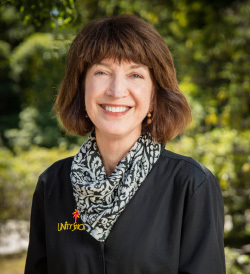 After cross-training in each of Unity’s 8 programs, Pat was ready and willing to help with the hundreds of referrals from the Red Cross during the 2008/2009 Tea and Jesusita fires. Providing individual attention to those that were devastated, Unity’s long-term disaster services program gave support and basic necessities for up to 2 years for some of those sent to Unity for services. From there, Pat began working with Unity’s Job Smart clients who needed encouragement, clothing, training, and resumes for job interviews. Currently, between 400 and 500 people are referred annually for assistance through this program. Cross-referring them to other Unity Programs as needed means offering additional support with food, school clothing and supplies, and other basic necessities that may be keeping them from paying their rent. Unity provides a lifeline, that gives hope to those in need and encourages them toward their goal of independence and self-sufficiency which all parents need in order to preserve family respect and dignity. Pat spends much of her time communicating with long-time donors and reaching out to potential new ones which has become Pat’s favorite activity. From years of traveling and meeting new people, she has no fear of unique situations or personalities and enjoys hearing how donors first became involved with the programs at Unity and finding out what might appeal to new ones. Pat is a vital part of Unity’s management team which continues to provide a shared vision for the future of the agency, implementing goals and objectives to advance Unity’s mission of encouraging a community effort of staggering proportions for all that want to work together to provide the best services possible for our low-income neighbors.